Features – 1. HDMI output supports 4k@30 Hz. 2. 3x USB 3.0 ports (5 GBPS). 3. Gigabit Ethernet port. 4. USB-C input for charging. 5. SD & micro SD media inputs. Juiced Systems BizHUB is the most advanced USB-C travel adapter. 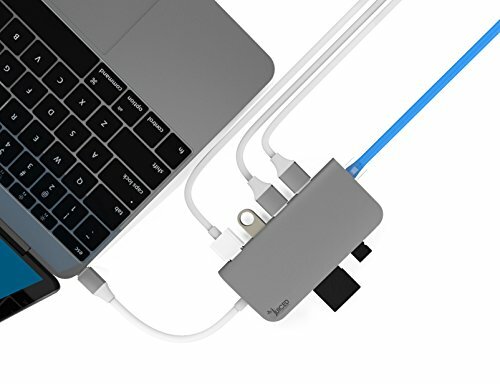 With the ability of empowering your USB-C device's full capabilities. You can easily plug n play the adapter to your USB-C device and extend an additional display via the 4k enabled HDMI port. Eliminate the bad Wi-Fi lag with a gigabit Ethernet input. Add multiple peripherals simultaneously to your device utilizing the three USB 3.0 ports. Read and write data to your SD and micro SD memory cards on the go. Always keep your device charged with the USB-C power delivery input. The aluminum designed body keeps the adapter durable to withstand travel. The compact size of the adapter makes it a convenient travel companion when on the go. If you have any questions about this product by Juiced Systems, contact us by completing and submitting the form below. If you are looking for a specif part number, please include it with your message.